There’s nothing better than searching through the latest Netflix releases as you snuggle up on your sofa in your lovely warm living room. The importance of having your own little sanctuary - a place where you can relax and unwind after a hard day - cannot be underestimated. 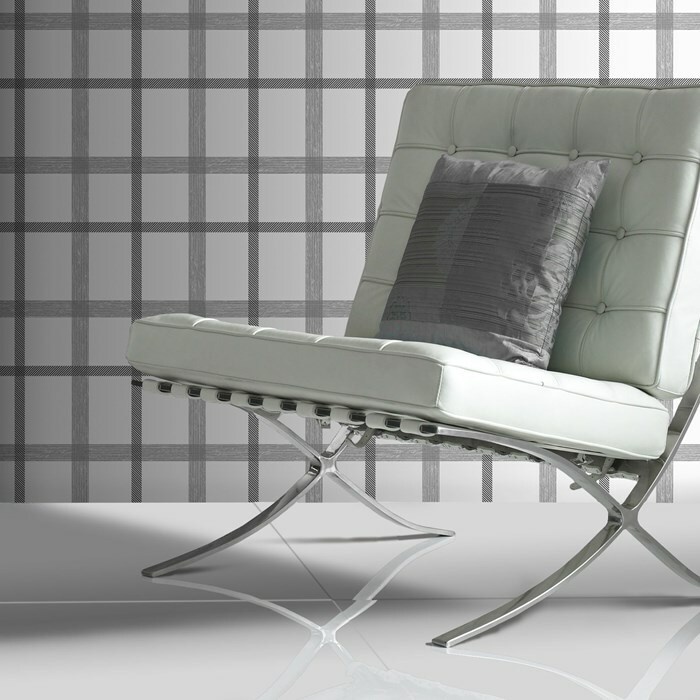 Of course, the way in which you design your home can make all the difference. To that end, Graham & Brown is here to offer some expert tips on how to create the perfect cosy living room. Bold colours work particularly well at this time of year. 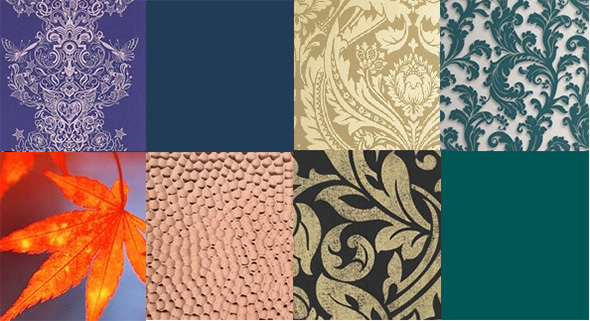 Rich shades of copper and deep blues can have a really positive impact on our mood, and whether you’re using paint or wallpaper to decorate your walls, you should always choose a colour that makes you feel happy. We recently discussed some of the benefits of using teal wallpaper in your home, and it’s worth pointing out again that this particular hue can really help to make your rooms feel warm and inviting. Our Majestic Teal wallpaper (pictured below) is a wonderful example of how this vibrant colour can make the most of the light, creating a warm vibe that envelops your entire room. You might opt for copper wallpaper instead. Replicating the beautiful colour of fallen autumn leaves in your own home, our Tranquil Copper wallpaper (pictured below) ticks all of the right boxes. It has a fabulous natural effect, and in similar fashion to the aforementioned teal design, the metallic colour palette works brilliantly with your lighting. 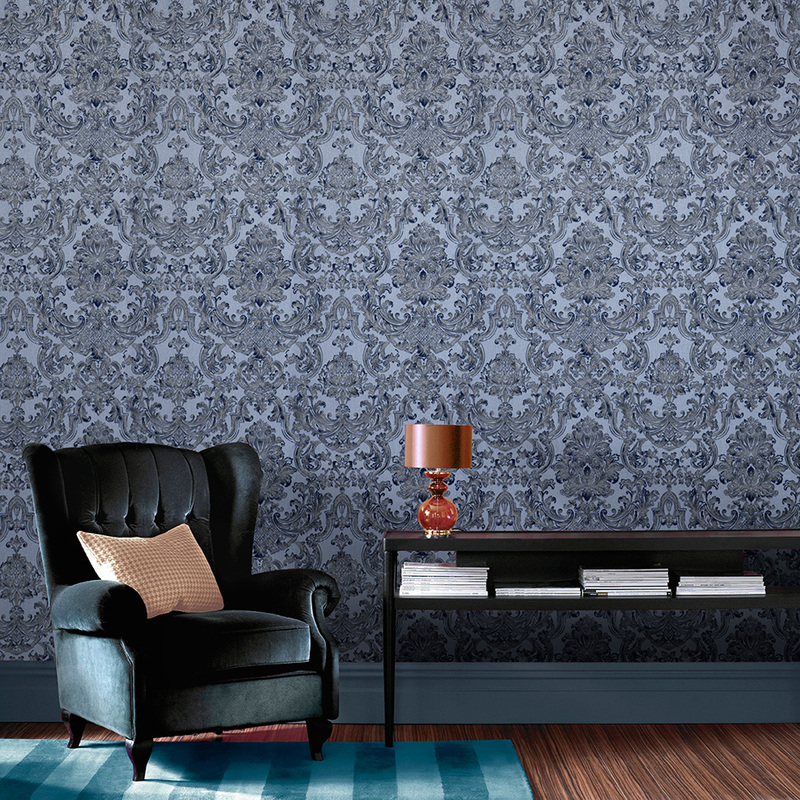 If deep blues are more your thing, then our intricately-designed Montague Blue wallpaper is sure to appeal. As you can see from the image below, this elaborate, bold design goes very well with wooden floors and furnishings, which is something we’re going to talk about in more detail a little later in this article. Here’s a hot tip. If you’re trying to make your living room feel more intimate, use horizontally-striped wallpaper (especially if you have tall ceilings). While vertical stripes help to elongate or lengthen a room, horizontal stripes can create the illusion that the room is more compact and homely. It’s a great way to create a cosy setting in a room that was previously a little bare and uninspiring. Our Java Plum wallpaper (pictured above) is superb. The bold plum tones are complemented by subtle, lighter colours, and the fabric-like texture makes you feel like you’re sitting in a huge (and stylish) winter coat. If you were asked to draw a picture of your perfect cosy living room, we’re fairly confident that wood will feature prominently in many of your designs. Simply put, nothing makes us feel as snug and happy in the autumn/winter months than a rustic log burner or open fire. Even if you’re not lucky enough to have one of these in your living room, it’s still possible to create a design that makes the most of any wooden accessories or furniture that you do own. You can see exactly what we’re talking about by taking a look at the image of our Plaid Charcoal White wallpaper (below). You don’t have to live in a quaint little cottage in the countryside to make this theme work in your home. It’s a fantastic look that anybody can recreate. 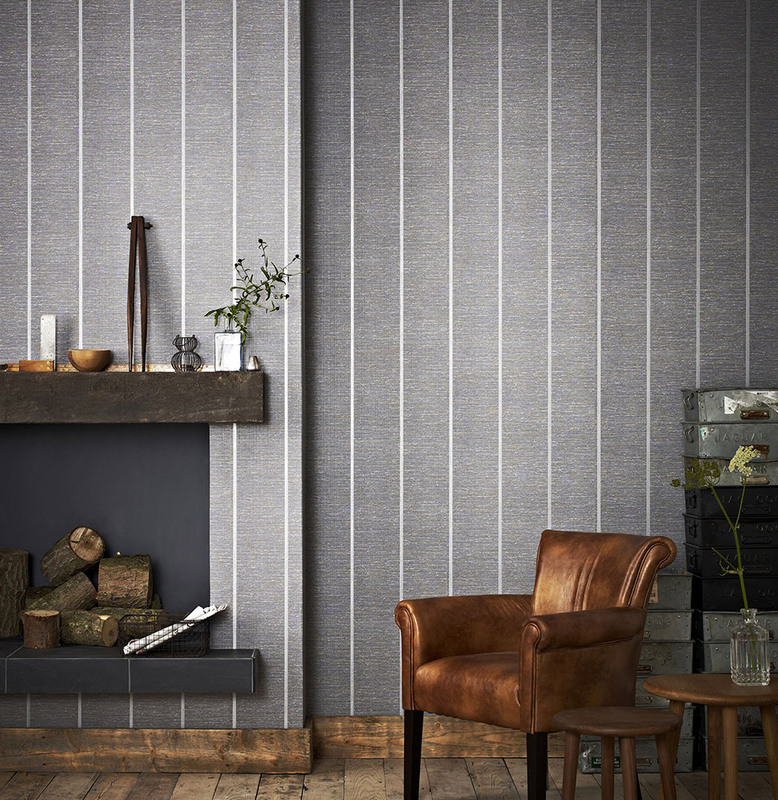 Our Prairie Charcoal wallpaper (pictured below) is another strong option. With beautiful silver embellishments offsetting the soothing grey colour, it’s like this product was tailor made for those who are looking for the perfect companion for their rustic timber floors and furnishings. 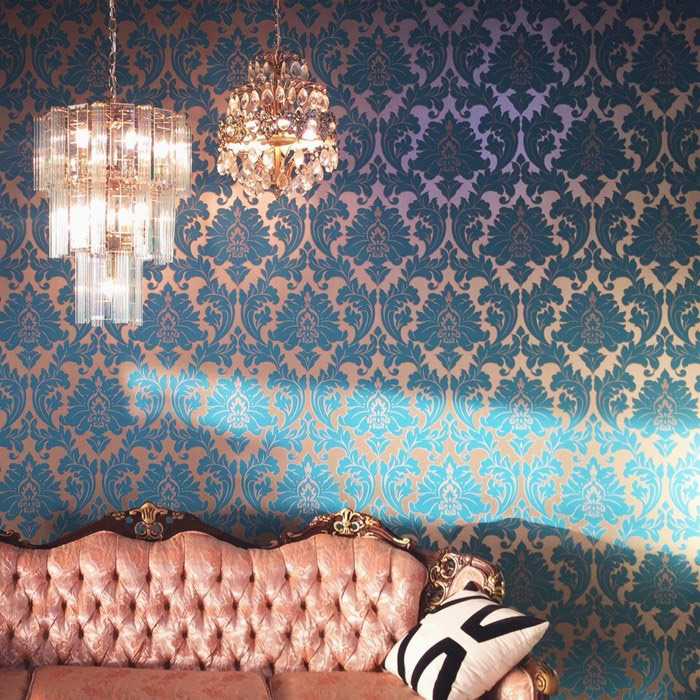 Explore more of our living room wallpaper designs. If you’re settling down on a dark winter night, with a glass of red wine or a warm cup of tea in tow, you’ll want to ensure that your lighting is spot on. It can make all the difference. 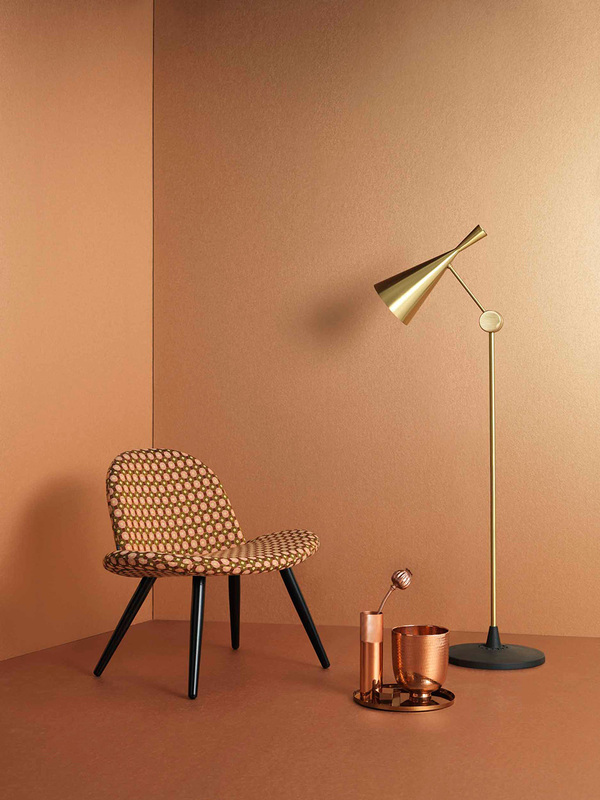 We’ve already touched on this point when talking about the reflective powers of our copper and teal wallpaper designs, and now we’re going to explain how carefully-selected pieces of wall art can also help to make a cosy environment. Turn your main lights down low and let the LEDs in this printed canvas create a subtle glow in your room. 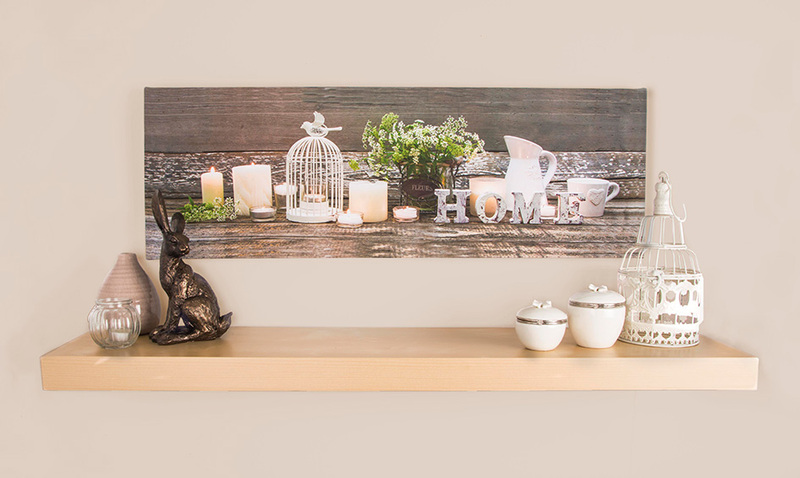 Aside from giving you different lighting options, our wall art also adds character to your room, creating a homely atmosphere that will make you feel at ease as soon as you walk through the door. 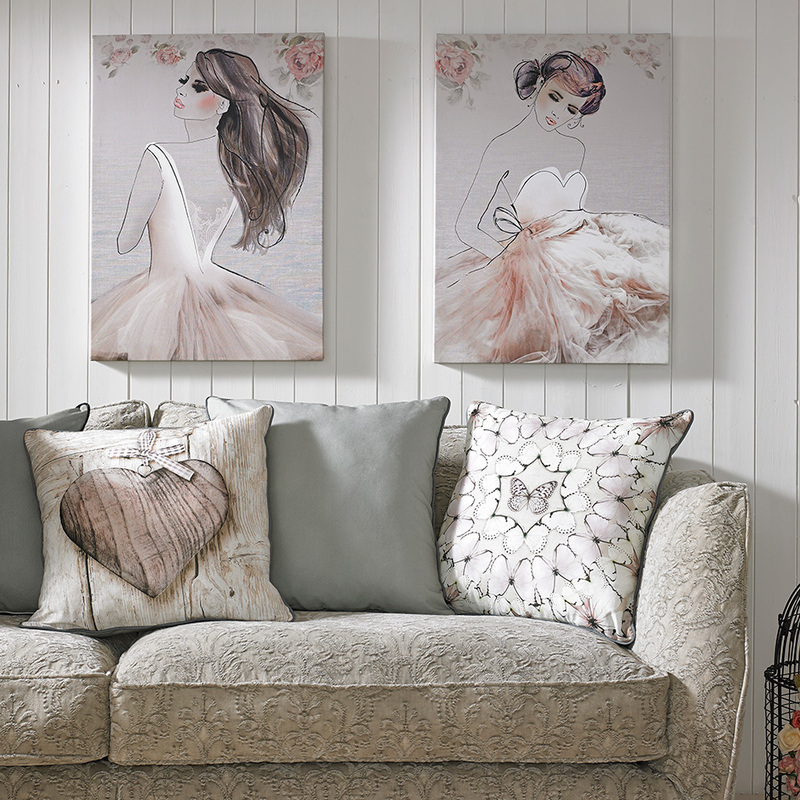 How else can we use wall art to create a cosy living room? Okay, so you’ve painted and wallpapered your living room, choosing colours and patterns that you love. You’ve even got your lighting down to a tee. Everything’s in place to create a cosy, welcoming space that provides you with an enchanting hideaway throughout the winter months. However, something’s missing and you can’t quite put your finger on it. It’s the little finishing touches that give your living room that all-important personal stamp - and this is where sentimental wall art and beautiful photo frames come into play. 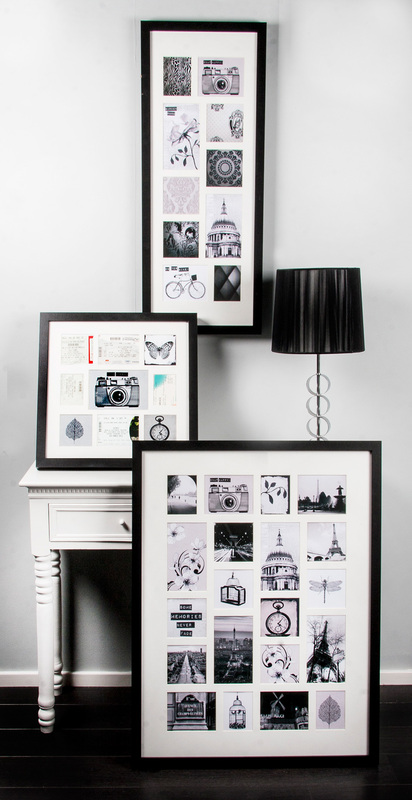 Filling our Treasured Trinkets frames with photos that mean everything to you - be they of family, friends, pets or special places that you hold dear - will ensure that your living room is even more welcoming. Knowing that your loved ones are all around you - even if it’s just in picture form - will make those cosy nights in even sweeter. Printed canvas wall art, meanwhile, can also lighten the mood in your main living space. We all get the winter blues now and again, but strategically placing eye-catching pieces of art that carry a positive message around your living room will give you an instant boost. 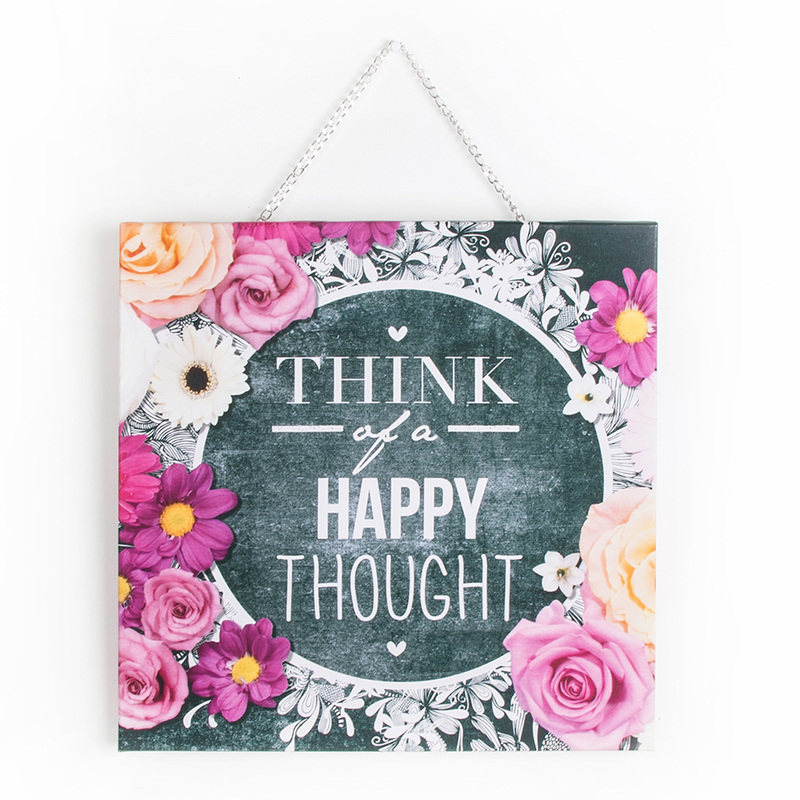 Just look at our Chalkboard Happy Thoughts Printed Canvas (below). That’ll put a smile on your face! The final piece of the cosy living room puzzle… cushions! If you’ve followed our advice up to this point, you’ll have a living room that looks cosy; now it’s time to make it feel the same! There’s no need to go out on Saturday nights in November, Instead grab a bumper pack of Doritos and some assorted dips, and snuggle up to our wonderfully cosy cushions in front of the TV. It’s easy to find cushions that fit in perfectly with the rest of your room. 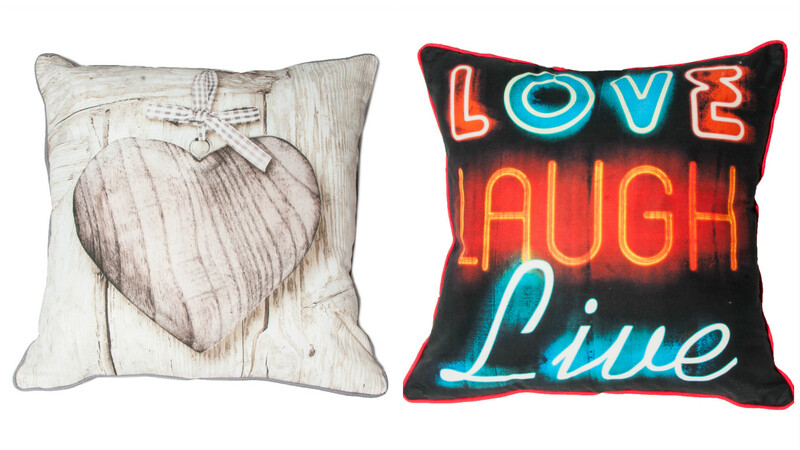 If you’ve gone for the wood-effect that we talked about earlier in the article, our Wooden Hearts cushion is ideal, whereas those who’ve opted for a bold theme might prefer something a little more colourful like our Neon Type cushion. As the summer months become a fading memory, make sure you’ve created your own little sanctuary that will inspire you throughout the autumn and winter seasons. As ever, Graham & Brown’s interior design experts are always on hand to offer any decorating advice that you might need. Please don’t hesitate to get in touch.